Hakkebøf is a genuine Danish specialty. 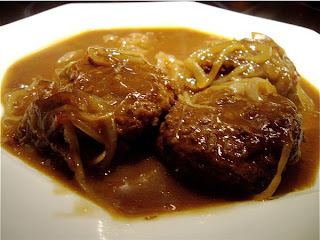 Coarsely ground beef made into generous sized hamburgers served with thick, brown gravy. A week and a half ago I tasted a few very decent ones, and believe it or not - they came out of a can. For me most canned ready made meals are no alternative to food prepared from scratch. As I and my good pal Terje did some grocery shopping on our way back from Sweden, a few months ago, he highly recommended a can displayed. 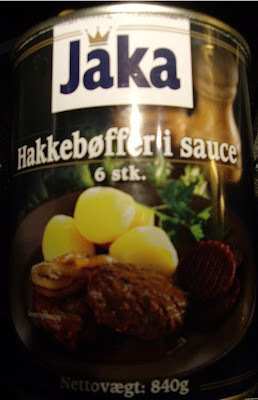 6 Jaka bøffer in gravy, produced by the Danish Tulip group, containing in total 840 grams, or around a pound and a half. Tuesday 3rd, I was home with a flu, and needed a quick dinner and found the Hakkebøf in my refrigerator. I opened it and was surprised to see that the six hakkebøffer were quite small, and the amount of sauce larger, making it suitable for two, rather than three dinners. I separated bøffer from the gravy and placed them in an oven proof dish. I chopped one medium sized onion and fried the lightly in oil, before adding 2 tbsp of sweet chili sauce to create a good balance. I poured the gravy over the meat, and placed in a medium hot oven (170C / 350F), until the sauce bubbled and bøfferne was heated through. Hakkebøffer from Jaka had a great meat structure, but I was surprised that it had very little seasoning, and could have had more salt and pepper to spice them up. Still, when adding the delicious brown gravy, it ended up like a winner. So if you see this brand in an Danish or Swedish shop, it is worth buying, but fortify the gravy in order to get the maximum experience.